The steering system warning light lets you know when there is an issue with the power steering system and will be disabled until fixed. Electric power steering systems have started to take over as the technology has become less expensive over the years. Electric power steering systems don’t require any fluid and are generally quieter; so, more and more vehicle manufacturers are starting to use them. 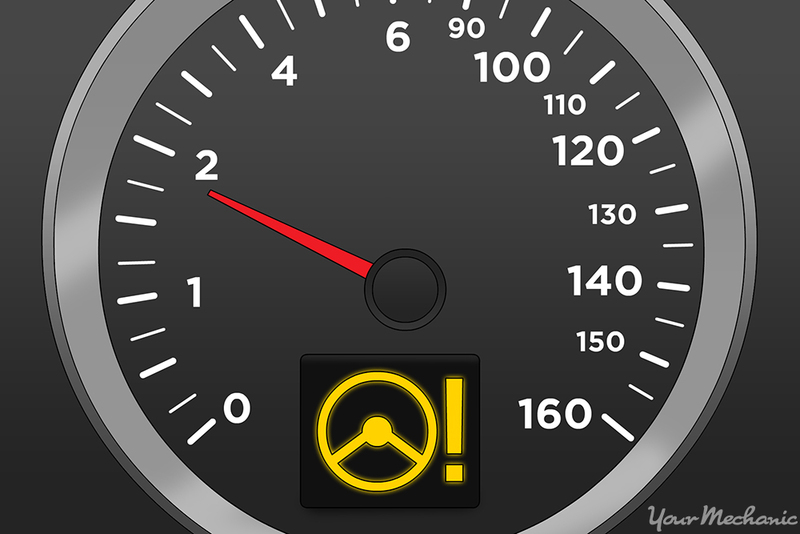 A warning light on the dash will let you know when a fault has been detected with the steering system. This warning light tends to be in the shape of a steering wheel, sometimes with an exclamation mark. For cars with electric power steering, the light may say EPS, for electric power steering. Either way, the warning light will be yellow or red in color. Hydraulic Power Steering Systems: A common reason for the warning light to illuminate is low power steering fluid. You should pull over if you see this light turn on and check the fluid level immediately. Top it off with the correct fluid type and the light should turn off. Keep in mind that low fluid means a leak is present that needs to be remedied at the earliest. Adding fluid will only be a temporary fix until there is no more leakage. If the fluid level isn’t the issue, you’ll need to have the problem diagnosed further by a certified technician and repairs will likely be necessary. With the light illuminated, you won’t have power assist to help you steer. You will still be able to drive, but the steering wheel will be very difficult to turn, so you will need to be extra careful when driving. Electric Power Steering Systems: The warning light won’t come on for fluid levels as there is no fluid being used. In fact, simply restarting the engine can sometimes turn the light off. Like your computer at home, small errors can occur that cause the computer to think there is an actual issue. A quick reset and the computer will see that everything is working as intended. If this warning light doesn’t turn off after restarting, then the issue needs to be diagnosed further. Like hydraulic systems, the power assist will be disabled for the time being and steering will be difficult when this warning light goes on. Is it safe to drive with the steering system warning light on? No. Without power steering, the vehicle will be very hard to maneuver. You will need to use a lot of caution when driving, so it’s best to not use the vehicle at all if you can avoid it. Otherwise, the lack of steering assist could land you in a collision. Replacing your power steering fluid at regular intervals will help keep your steering system in top shape. If you have any issues with your power steering system, our certified technicians will be able to help you identify any problems.